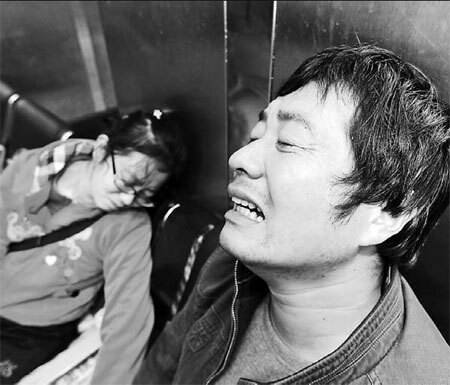 Family members of a girl killed in the blast cry in a local hospital where the girl was announced dead. XI'AN - Nine people were killed and 37 others injured in a gas explosion on Monday morning in Xi'an, capital of Northwest China's Shaanxi province. The explosion occurred at 7:37 am in a snack restaurant on the first floor of a 22-floor building, Jiatian International Apartment, in the southern suburb of the city. Initial probe finds that the explosion was caused by a gas leak. Firefighters carried three 1.5-meter-tall liquefied petroleum gas cylinders out of the restaurant, according to Jiang Yongmu, the leader of the team that arrived on the spot at 7:45 am. The firefighter said that the explosion was very strong. The restaurant and a foot massage parlor on the second floor were completely ruined. The explosion also damaged at least 11 vehicles parked in front of the building and a bus stop shelter some 20 meters away from the restaurant. Several windows of the buildings across the street were shattered by the shock wave. According to a witness who was waiting at the bus stop, a car got dragged some 10 meters away from where it was parked and many passers-by, including himself, were injured. The man rushed to the hospital without leaving his name. A few children, students at a school nearby, got killed and some were injured. Rescue work began soon after the incident and injured people were sent to two nearby hospitals for emergency treatment. Zheng Shicheng, a doctor heading the emergency department of Xi'an Gaoxin Hospital which received 23 injured patients, told China Daily that Wang Miao, an 8-year-old girl, was confirmed dead when she was reached to the hospital. A woman surnamed Yao told China Daily that her 13-year-old daughter was also seriously injured on her way to school and was receiving emergency treatment in the hospital. Xi'an blood center said it had enough blood in stock to deal with emergency treatment in case of an accident, but in this case the demands placed were not very high. Water, power and natural gas supplies for residents around the explosion site remained normal. The traffic situation returned to normal after five hours of blockade. 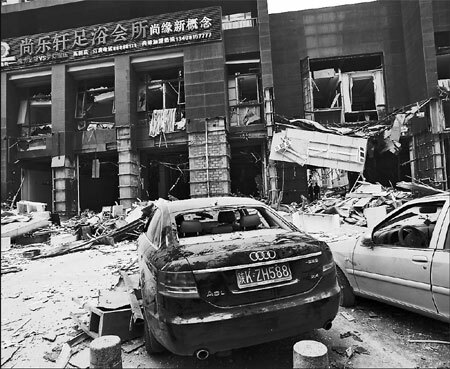 The information office of the Xi'an government confirmed that nine people were killed and 37 injured in the explosion. At 2 pm, three people with minor injuries had left the hospital. Others were still under emergency treatment. Chen Baogen, mayor of the city, visited the spot and ordered firefighters, police officers and officials to make all efforts to rescue the injured, put the traffic back in order, run a check on damaged buildings and further investigate the cause of the accident.